Need a gourmet pick me-up? Our range of gourmet soup flavours make for a deliciously uplifting snack. 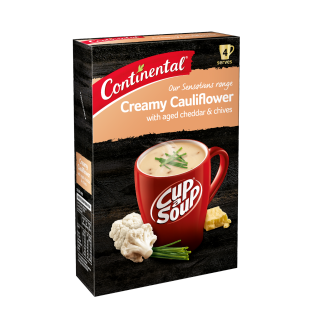 Try Continental Sensations Creamy Cauliflower with Aged Cheddar & Chives! When reconstituted: cauliflower (36%) (contains sulphites), potato, onion, thickener (1412), skim milk, aged cheddar cheese (4%), cream, sugar, creamer [vegetable oil (contains soybean derivative), glucose syrup (from wheat), milk protein, mineral salts (339, 450)], salt, vegetable oil, maltodextrin, yeast extract, chives (0.5%), wheat flour, natural flavours (contain milk and soybean derivatives), mineral salt (potassium chloride), garlic, black pepper. Allergens:Contains milk, soybean, wheat products and sulphites. Made on equipment that also processes products containing peanut, egg, sesame, fish and crustacea. For the perfect mid-week meal for two, try this chicken pasta bake. Easy to cook and deliciously creamy, it will become your go-to dish any night of the week. My new favourite go to soup. delicious and perfect for lunch or snack, Creamy and smells amazing too!